On Wednesday, November 15th, at 6:30 p.m. the public is invited to attend a meeting where the South Castell Visioning Plan will be presented and discussed. 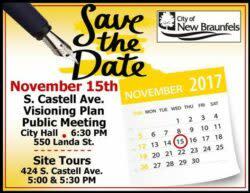 This is the fifth in a series of planned public meetings to involve the community in the visioning process that is underway for the South Castell area in downtown New Braunfels. The meeting will be held in Council Chambers at New Braunfels City Hall, 550 Landa Street. Previously, on July 17th, the public had its fourth opportunity to provide their input and suggestions on the City’s South Castell Avenue Visioning Plan project during a televised joint meeting of the New Braunfels City Council and Industrial Development Corporation (NBIDC). As in the preceding four public meetings, this gave residents, and property and business owners another opportunity to see the progression of the plan since the prior meeting and to provide their input. The November 15th meeting will continue this progression. Additional public meetings are anticipated as the vision continues to evolve. Tours will be available at 5:00 p.m. and 5:30 p.m. – at 424 S. Castell Avenue. More information will be provided prior to the tours about parking, meeting locations, etc. “This plan will help to advance the goals of a citizen-led process from the 2012 Economic Development Strategic plan, which recommended the city facilitate the development of a large downtown investment to support recreational, cultural, and tourism amenities in New Braunfels. This is a lengthy process that will go on for a number of years,” added Camareno. There are several more years of work to complete the project. Next steps include: a sixth public input meeting in January of 2018, finalizing the plan and adoption by the City Council, creating a new zoning district, constructing a public works facility to house City operations and equipment still at the Castell Avenue location, qualifying development groups that would be a good fit for New Braunfels, establishing a Design Review Committee, soliciting requests for proposal for construction and negotiating a final development agreement.